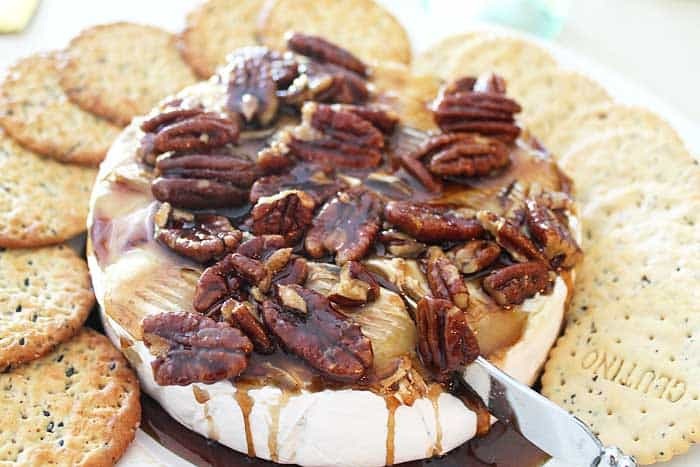 Kahlua Pecan Baked Brie is an impressive but easy appetizer to add to your holiday cheese tray. 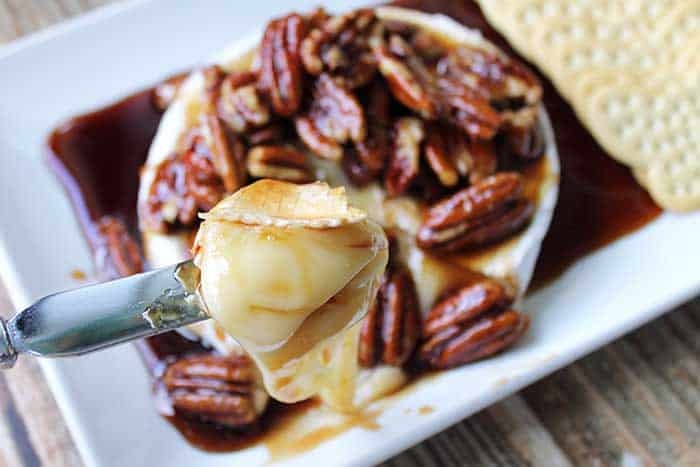 It’s a warm creamy cheese topped with sweet candied pecans that carry a subtle coffee flavor. It’s December! Can you believe it? It just kind of crept up on me and now I’m charging full scale into Christmas baking and whipping up some tasty appetizers for holiday parties. 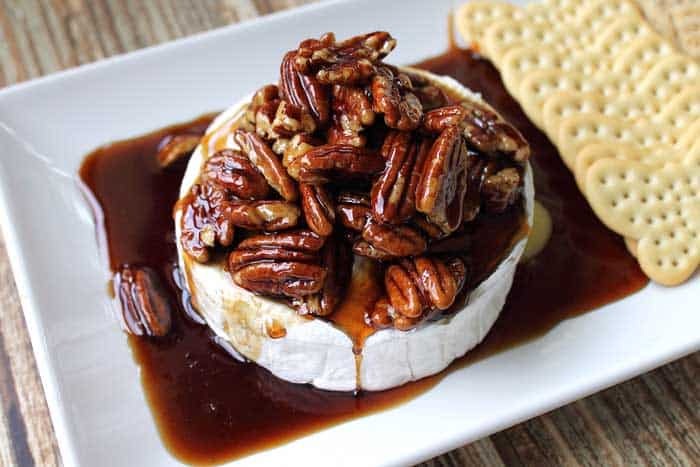 This Kahlua Pecan Baked Brie is one of my favorites. I usually serve it along side some crispy Crab Wonton Cups and Spinach Stuffed Mushrooms. It’s easy to make and looks like an elegant appetizer that took hours to make. Ahem, don’t tell anyone but it only takes about 15 minutes. That can be our little secret. The prep is mostly hands off and while you’re prepping, you can bake the brie wheel so it’s all ready for the deliciously sweet and nutty topping. It’s a great addition to a cheese tray and a glass (or two) of wine or a holiday Cranberry Mimosa. 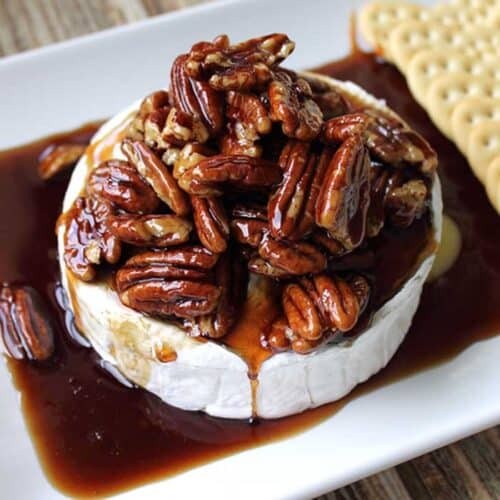 Kahlua Pecan Baked Brie is an impressive but easy appetizer to add to holiday cheese trays. It's warm, creamy & topped with candied pecans & kahlua. Preheat oven to 350 degrees. Line a cookie sheet with parchment paper or a silicone mat. In a small saucepan, heat Kahlua and brown sugar stirring constantly until sugar has dissolved, about 5 minutes. Continue to cook for another 10 minutes or until mixture thickens and foams, stirring occasionally. Add pecans and heat until warmed, about 2-3 minutes. Remove from heat and pour over the top of the cheese. While Kahlua sauce is cooking prepare the cheese. Partially slice the rind off the top of the brie wheel but leave in place. Move brie wheel to prepared cookie sheet and bake in oven for 15 minutes. 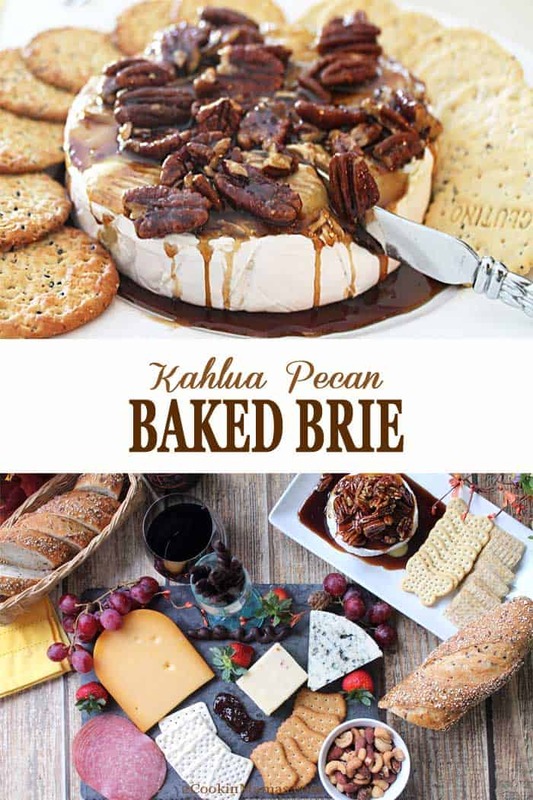 Remove the top rind carefully and pour Kahlua-nut mixture over top of brie wheel and serve immediately with mild-flavored crackers. For gluten-free diets substitute delicious Glutino Gluten Free Crackers, Original in place of regular crackers. 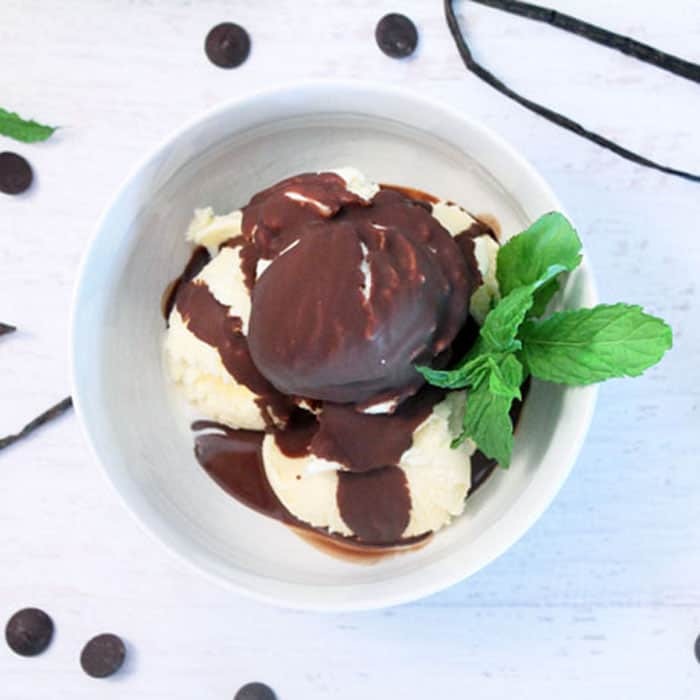 This is so easy and elegant, and you can’t go wrong with Kahlua! YUM! So true! And I always get asked for the recipe whenever I make it. OMG, this recipe has everything that I LOVE and never thought to combine. 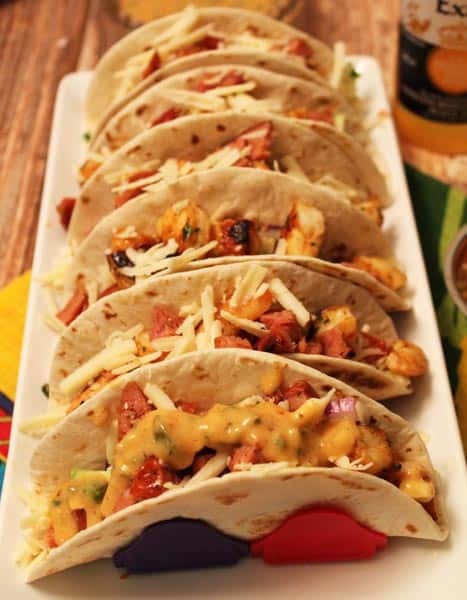 I can’t wait to make this for our super bowl party! Great idea! I’m sure it will be a hit! This looks delicious! Im a big brie lover so I can’t wait to try this! YUM! 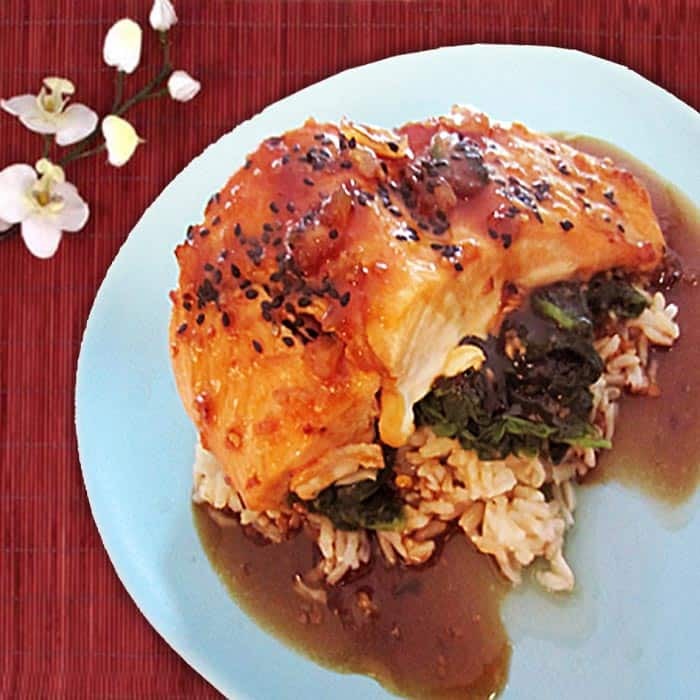 It’s really delicious and so easy. Hope you enjoy! That sounds so good, and I don’t even like coffee! I love how it’s so easy, but still looks impressive. It’s great for parties and I haven’t found anyone yet that doesn’t like it. Even my daughter, who also doesn’t like coffee, really likes it.